Welcome to TowMate - EMERGENCY, TRANSPORT, RECOVERY AND RECREATIONAL LIGHTING. EMERGENCY, TRANSPORT, RECOVERY AND RECREATIONAL LIGHTING. "THE ORIGINAL"! 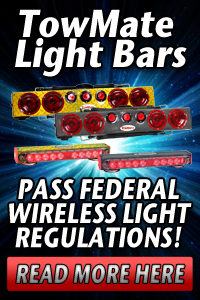 Celebrating 26 Years of Wireless Tow Lights! Our lights have been tested and are FCC approved FCC# UZV158TM27. Copyright TowMate. All Rights Reserved. eCommerce Software by 3dcart.